In our latest Foodie Profile, contributor Amelia Harris chats with Rachel of Sweets for Tilly much loved for their bespoke cakes, macarons and sweets; about baking and business. Tilly was actually my grandmother, my Mum’s Mum, Mathilde. I think I was five when she passed away. We spent ages when we were thinking of starting this business about what to call it. Everyone says you’ve got to pick something that means something. Mathilde taught Mum not just about food but our values – things like how you treat other people, always treat people with respect, share what you have with others. Everyone kept saying, `Your cakes taste great, you should share it with other people’. Even before we started the business, we’d bake cakes, have big lunches and it seemed like she was present. It just seemed like the best name. 2. You are a mother and daughter team. Could you tell us a bit more about the three of you as individuals and how you started Sweets for Tilly? Mum (Jacqueline Sham-Yuen) came over to Australia about 45 years ago, emigrated from Mauritius. She always had a creative streak; she liked gardening, she always had a thing for cakes. She just decided to go to a couple of cake decorating courses … (and) started to learn how to do fondant sugar flowers from scratch. Now we use moulds and things to help us cut out the petals but she learnt how to do it bit by bit, then from there when she had my sister – she’s the eldest – basically for every birthday, every celebration, she’d make all our cakes so we were always surrounded by cakes and food from our first birthdays. I found a photo a few years ago of a rabbit cake my Mum had made for my sister. Every year we’d get to pick whatever cake we’d want from the (Australian Women’s Weekly Cake) book and she’d make it. That was what we were used to growing up. When all three of us got married she made all our cakes for our engagements and weddings. She did everyone’s cakes. Mum is retired but very active in the business. We do lean on her a lot, just for her experience. You can Google things and go on YouTube but that is not the same as having someone there and showing you how to do things and we really value that. She will show us how to do things (and then you think); `Oh yeah that makes sense’. Even today I was second guessing myself – we do that a lot- and it was like `Call Mum, ask Mum’. My sister (Nancy) is actually by trade an accountant. She is fully qualified, got a CPA all that sort of stuff but she is very creative. People are often surprised. The (cakes) that are out there are normally her ideas. The moss cake we did was her idea. She will say, `I can picture there is moss’. She has these ideas and visions and thinks `How can we make it into a cake?’. I’m the one who has to scale it back and say, `I like it but how do we do it?’ I’m creative but I’m also more practical. She has this eye for doing stuff and says somehow we will make it work. The business came about just over three years ago. I was just about to go on maternity leave from my job as a corporate trainer at Monash University and my sister said, `Let’s start this business. If we don’t start it we’ll never start it’. Literally like a month after my son was born we basically drew up all the paperwork to start the partnership. We made a decision to see how it went for the first year because I had a year off for maternity leave. We did a lot of markets, a lot of stuff on the Mornington Peninsula, just to get that local awareness and let people know who we were. After the year I went back to Monash working part-time for a little while. I just felt it wasn’t working. I couldn’t devote half my time to the business and half my time to Monash. I knew where my heart was. We basically sort of made the decision for me to spend more time to do what I truly loved and also I wanted to be around more for my son. I stopped working at Monash and focused on growing the business. We have shifted our focus a bit now. We are doing more event expos and weddings, especially being on the Mornington Peninsula, and some corporate work as well. 3. All three of you are based in different locations across Victoria, how does this work from a logistics point of view? I’m down here on the Peninsula. My sister is in Macedon and my Mum is in Oakleigh. It works well in a lot of ways. We have got a cake due on Monday in Sorrento. My sister is doing one part of it and I’m doing the other part of it. We generally meet at Mum’s place and use it as a pick up and drop off point to give each other what we have made. The three locations mean we can cover a lot of ground. 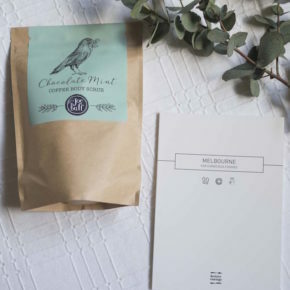 People are always wondering `If you are in Mount Martha how much will it cost to get it delivered to Stones of the Yarra Valley, which is two hours away?’. People say, `I like your stuff but I don’t want to be hit with a $150 delivery charge’ for example. We work it out based on the closest location to you. We also work with many local venues and suppliers. 4. 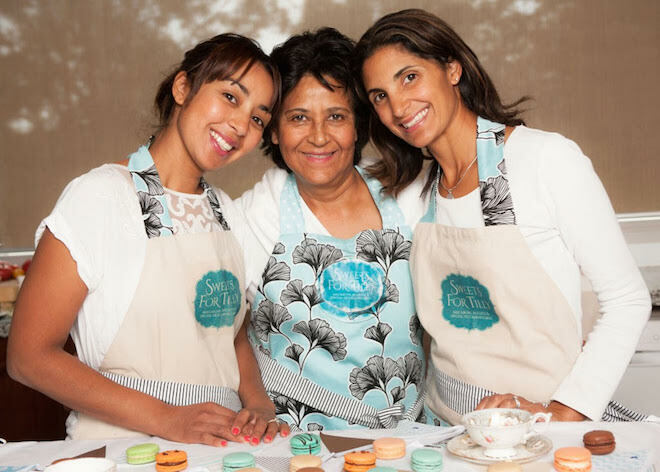 You are of Mauritian heritage, do you offer any traditional Mauritian treats in your range? We do. We do a shortbread biscuit called Napolitaine. It’s got jam in the middle and is covered in pink icing and that’s a traditional Mauritian sweet. It’s very sweet but it is very delicious. We make it on order. We are actually finding people who are married to a Mauritian have tried it and love it. That’s probably the most traditional Mauritian thing we make. We also make a Mauritian vanilla tea macaron. Mauritius has really good vanilla beans so one of the things they do is a black tea infused with vanilla. We infuse that tea into white chocolate and put that into a mac. People often say it tastes like a blue heaven milkshake but to me it tastes like the tea. When we wanted to do something that paid homage to our heritage that was something that made sense to us but modernised it. It is actually surprising how many people we meet along the way who are married to a Mauritian or had a Mauritian colleague who have had the tea. We have sent them interstate so we sent a 12 pack to Sydney for a women’s cousin. She said, `I love them and I know my cousin will too’. We have clients who text a couple of weeks in advance saying, `Are you making any?’. 5. What are your most popular products? 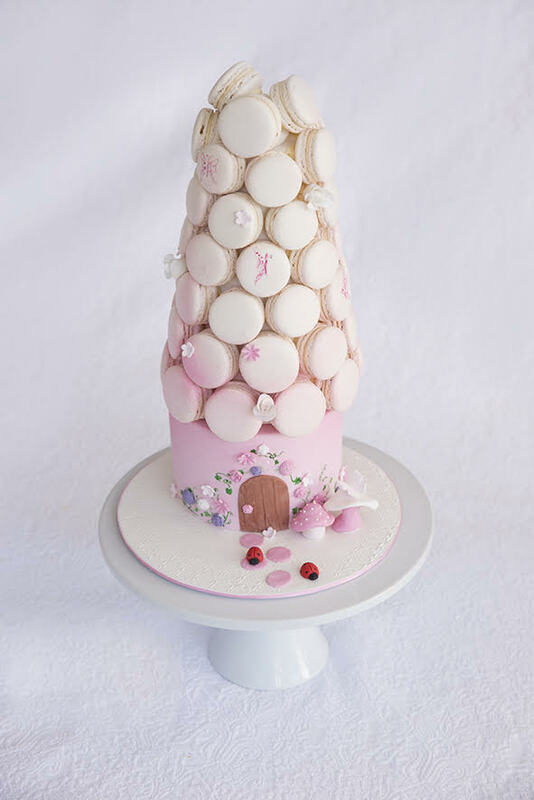 Definitely the macarons, especially with the whole craze at the moment with macaron towers. I think the best thing about them is we always tell people, `If you are worried about having left over cake, don’t worry’. We have never come across a couple that said, `We had 10 or 15 macarons left over from the tower’. We make sure we leave a few left over for the bride and groom so they can have some. We just think you wouldn’t want to miss out on something you have been looking forward to and you want to be able to taste it. 6. You are involved in supporting women’s business. Could you tell us more about this and any social enterprise projects you collaborate with? We are part of Soar (a women’s business network based on the Mornington Peninsula which is now expanding into parts of regional Victoria). I think we saw it as something that just seemed really authentic and I know that word gets thrown around a bit. With some networking events, I think I walked away thinking, `I need to make a million dollars or I’m not successful’ whereas (Soar founder) Jess says `It’s OK to say you are having a crappy day’. It is great to see other women in business succeed and grow and want to be part of their success. We have also donated to various charities that have values that align to ours like Sunrise Children Cambodia. We have kids and think our kids are so fortunate. I think we’d love to do it more we just need to set aside the time to do it properly and regularly. 7. Your sweets are made with all local produce. Could you tell us about some of the producers you work with? The big one on the Mornington Peninsula is Sunnyridge strawberry farm. We are constantly supplying them with strawberry and cream macarons. 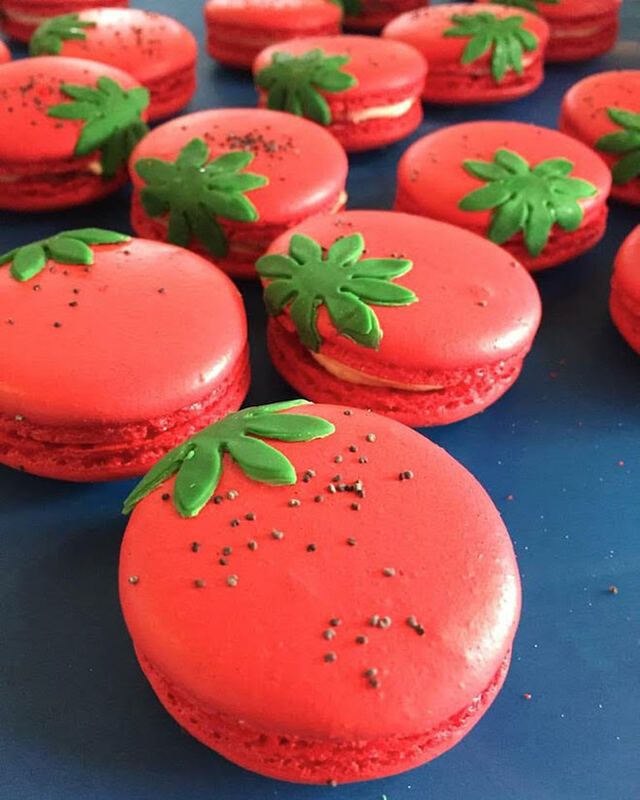 We get the strawberries from them, make the jam and then make macarons and they have them on a tasting plate on the menu in the café and the shop. There is also a strawberry farm near my sister where she gets her strawberries. The strawberries and cream flavour is probably the most popular flavour apart from the salted caramel. The look of them is kind of cool as they have the green hull and poppy seeds. We have developed it through market research at expos so it isn’t too sweet so the tartness of the fruit cuts through the sweetness of macarons. We also get a lot of fruit from Sunnyridge and the Peninsula. That’s a question we get a lot from brides who want a certain cake they’ve seen. We go back to brides and say, `You are going to pay a little bit more for the fruit because it is not in season but it is literally from down the road’. 8. Macarons are the product you are most famous for – what are special and different about your macarons compared to others on the market? We try to stick to what is in season when it is as fresh as it can be. In summer there is a mango macaron where we use fresh mango. We also do a fig and honey one using the figs from my parents’s massive fig tree. We have got all these figs and Mum said, `Why don’t you put it in a macaron?’ Mum is really good with that. We set aside several weekends and just make batches and batches of fig jam and then put it into a macaron with white chocolate with honey from my sister’s neighbour who is a beekeeper. That’s what makes it special; that there is a story behind it, that it is not just honey off a shelf; that it is homemade jam and I think that’s what people like to know. If people really want it and we have run out of the jam we will do it but we prefer to make it ourselves. We also have a cocktail macaron range with things like cosmopolitan, Baileys and espresso martini. 9. How do you make yourself stand out in an increasingly crowded industry? We are constantly asking ourselves that. It’s a combination of using that experience with us doing our thing and doing it as a family. We care about what we produce and people loving what they get. We still get nervous with little things like doing deliveries and it’s just because we care. We want it to be right. We want it to be perfect for the bride and groom and it always is. If we didn’t care we’d just leave it to anyone to deliver. 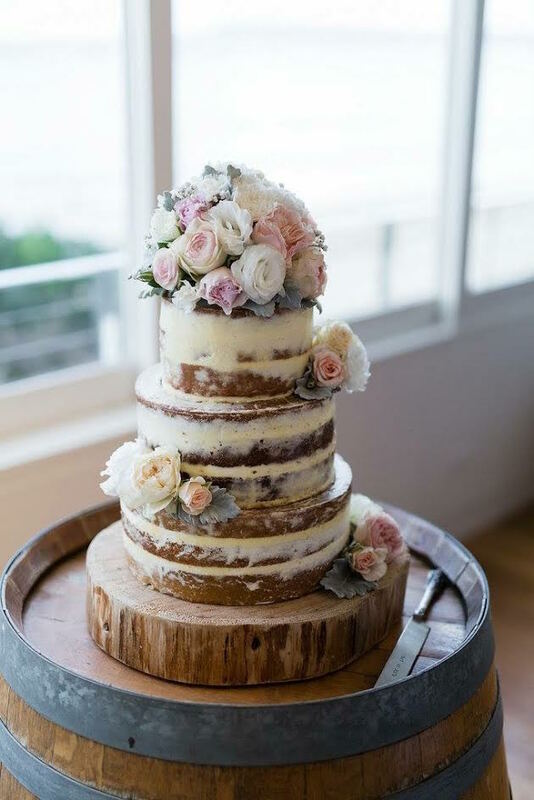 We love talking to the brides, we love that it is still us baking it. It is still me or my sister baking it and knowing exactly what has gone into it and someone does care what it looks like. Also being able to do it with my Mum and my sister, that is a big thing. 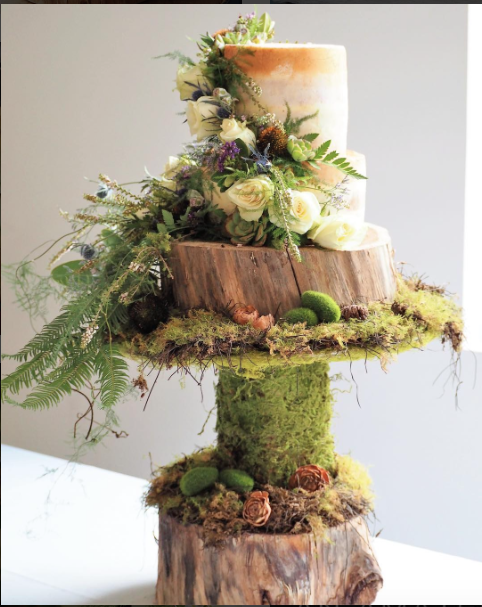 Mum always says, `When I did my cake decorating course, making the sugar flowers all those years ago I never thought my kids would be doing the same thing and want to make it their passion’. She often gets a bit nostalgic. She still makes the flowers from scratch for us. It’s us, a team making it for you. I think if people like that story they’ll go with us. I hope it is always us running it, putting it all together and seeing it all happen. There is no one else answering emails or phones and, I think, especially with brides they want to talk to the person. 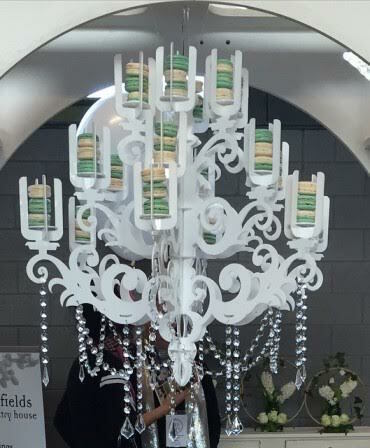 Something unique we offer is a macaron chandelier. My sister had this crazy idea where she said,`I’m picturing a chandelier that can hold macarons and people could hire it and we set it up and supply the macarons’. We spoke to my brother – he is actually an industrial designer – and he said, `Yeah I can basically come up with something’. He designed it and created it for us. We have changed the structure a bit. We have hired it out a few times for a bridal shower or an engagement and want to keep getting it out there. That is really unique. I haven’t heard of anyone else that does that. Consciousness – do you have a focus on local or organic produce, sustainability/environment, and giving back to the community? If so, please tell us more! We tend to give our suppliers and regular clients packaging we know they can reuse. We try when we can to find a packaging alternative. We say, `If you are going to throw the box away, give the box back to us’. We probably do that a bit without thinking. I think more and more we are giving people that option of giving people containers to borrow. I think definitely trying to find local produce is a big thing. We have got access to it so we should try to use it. We do a lemon and poppy seed macaron and we have a huge lemon tree at my parents’ house. I always cry if I need a lemon and I don’t see my parents and I have to buy one at the shops. I always think `this is not a lemon’.